It is almost Christmas but, it is always Riding Time! So, what better post this month than one which recommends some of our favourites ideas for Christmas presents. We know there are tonnes of bits you could buy a biker, but we have decided to make your lives easier and compose a list of recommendations from a couple of our favourite retailers: Get Geared & Hideout. Having experienced the snow and sub-zero temperatures this week, we all know it can get cold at this time of the year! So, what could be better than a pair of cosy, thick and warm Halvarssons shocks? Natalia uses them and she loves them! With all these dirty roads and salt thrown at you from all directions, you may find your helmet is filthy and you can barely can see through your visor. 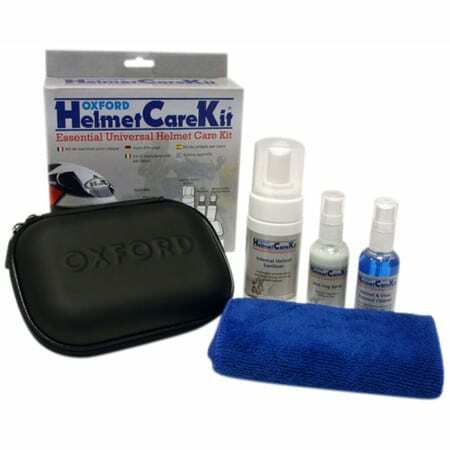 Oxford do an amazing compact Helmet Care Kit that you can take with you or keep at home. We use it after every ride and even take it with us when we travel. Don’t forget that the cold does not just affect you! During winter, many bikes at shut away in garajes and aren’t warmed up. Why not treat your bike to a nice new coat? The Oxford Aquatex Cover will keep your bike dry and protected against the elements. Whilst you are off singing carol or skiing in the French Alps, it is vital your bike is kept safe and secure. We use the Oxford Quartz Alarmed Disk locks in both our bikes. They are easy to get on, easy to get off and warn us if someone attempt to move our babies! Sometimes you may need to carry something small on the bike, where panniers or a top box just aren’t necessary. This Kriega DryBag will allow you to carry your stuff on any bike as you can attach it to the seat pad. It is fully waterproof as well, so perfect for those rainy days. During the winter, we want to be dry but also be seen. That is why we use the Rev’It! Cyclone 2 H2O Ran Jacket in yellow and the Rev’It! Acid H2O Rain Trousers. Both Natalia and I have them and can tell you they are brilliant! You may have seen me wearing them in some photos on our Instagram account. Not only do they look good, but they will keep you protected! Also, because Hideout specialises in custom made gear they will be able to do modifications if you need them! You can read here about when Natalia got hers. Cold hands? Don’t worry! With these Gore Tex Winter gloves you will be covered! I have a pair myself and find them confortable and warm in the winter. If you really want to treat someone (or yourself) these holidays, why not take them to Hideout to get a made to measure suit! Get yourself warm and protected with the latest helmet from Schuberth. This helmet is not just the latest in flip up helmets but has an amazing inner liner that will keep you warm and confortable all year round. To see more about this helmet you can see our review here. If you have any suggestions or have a special gift idea, leave us a comment! We love to hear from you guys!